We’ve been making steady progress in all areas over the last month. Yes, I guess these posts have become a monthly thing, but I am going to take this opportunity to embrace the monthly schedule and align it to development schedule. Since earlier this year, we have been assigning tasks to a monthly “milestone” and then trying out best to complete them all by the time the month ends. After a bit of trial and error, we are gradually accustoming ourselves to this process and meeting higher rates of completion month on month. We also have the new changelog system that is approaching completion, which will replace much of the content (ie. per-change explanations) I usually cover in my blog once complete, so I will be shifting my focus here to focusing on a more macro scale of “how we did last month” and “what we have planned for this month”. I’d just like to mention that much of the process we’re following is heavily borrowing from the vscode project, so huge props to them for their amazing open development efforts and solid development process. They obviously have a much larger team and dedicated project management so we are taking some shortcuts, but I’m pushing for more process as it feels feasible and productive. In an interest of establishing a schedule we can adhere to, I’m going to keep the goals slim this month. Not mentioned in this list is the huge backlog of issues that require fixing, which can be found assigned to the respective monthly milestones. I hope we can fix remaining netcore issues (mouse hiding and other native functionality) in order to make .NET core our primary target framework by the end of this month. The 2.1 release fixes the remaining issues we had with debugging the solution on macOS and brings performance on a level that surpasses both mono and .NET desktop (471). Many people are reporting hard crash issues on github without knowledge of how to report correctly or fix. I hope to make this reporting automated (via Sentry) and remove this manual overhead. As the number of projects dependent on these increases, referencing them via submodule is getting quite cumbersome. By deploying nuget packages we can more easily keep individual projects segregated and maintainable. With more of the UI designs nearing completion, it feels about time that we get the infrastructure in place for osu!lazer multiplayer. This is a stretch goal and will likely not reach the point of gameplay being possible, but the lobby and room system should at least have some client-server structure in place. As we move the editor forward, we want to allow for arbitrary rulesets to be easily added with first-class editing facilities. In order to make sure everything is structured correctly, we will be focusing on getting the osu!mania setup in a usable yet modular way. 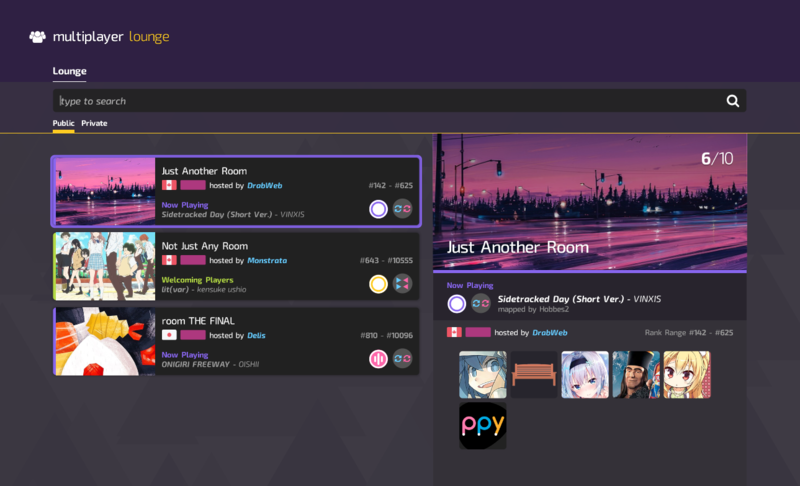 As mentioned in my previous post, this will be the new hub for keeping track of the ongoing development efforts invested in osu!. Having the new design completely deployed will reduce the strain on me to manually produce changelogs in a blog format and hopefully make tracking development more accessible for the wider audience. I have been performing ongoing migration of MySQL servers to new hardware and software (5.6/5.7 to 8.0). In order to complete the last stages, I would first like to reduce load (and reliance) on the servers. Moving score lookups to elasticsearch will do this, but also allow for arbitrary lookups which have not been possible until now due to lack of indices. We’ve been working on the framework required to get a private messaging system deployed to replace the ageing (and disconnected) forum-based system that is only accessible on the old site. While a bit of a stretch goal, we hope to have this deployed by the end of the month. This will contain any command line tools (.NET core) which consume lazer. Currently you will find a difficulty calculator tool which will be the go-to method of testing new Star Rating changes. This will contain server-side components that don’t fit in the current laravel system. This repository is still undergoing some structural consideration as we decide how many git repos we want, but for now will house the .NET core version of osu-performance (Performance Point calculations) and a new Elasticsearch score indexer – part of an ongoing effort to alleviate MySQL of the heavy load of score/leaderboard lookups. Pretty good progress and relatively high completion rates, no? Let’s delve into detail in each respective project. This might be the last time I do this if the new changelog page goes as planned (I won’t miss it!). 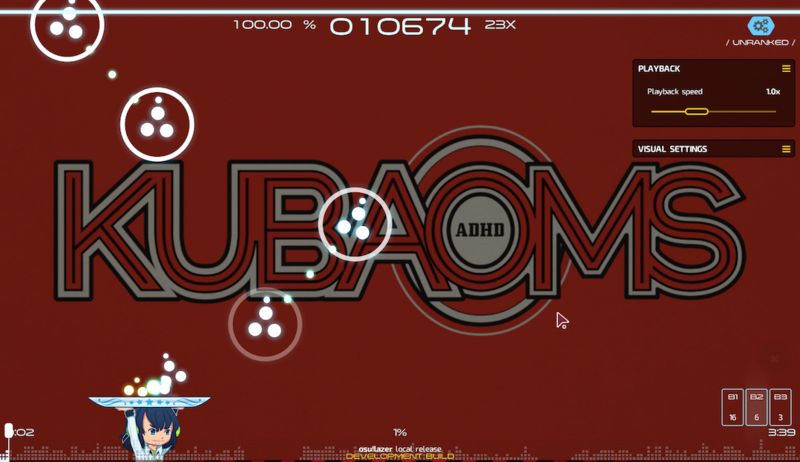 After many months of Yuzu being completely oversized (big-boned; not fat), osu!catch gameplay scale has been refactored to mostly match stable. A lot of users were reporting that beatmap imports were getting stuck. It turns out that a single failed import would hold up the import process indefinitely and cause all subsequent imports to fail. There were quite a few reasons for this happening, but most should now be resolved. Do note that we are still tracking one remaining case where imports can fail. No-keyboard players rejoice! You can now pause or exit gameplay without a keyboard handy. This is a definite requirement for mobile support. You can now bind joystick buttons, hats and axes to anything that was bindable in-game! This allows for a huge amount of new control customisation which was never before available - even on stable! While not yet functional, the designs for multiplayer are now more complete than ever. Don’t you just want to see this list populated with real games? Loading spinners will finally spin again! Heavy testing added for input states. We’re still not done refactoring the input framework, but this is a step in the right direction towards not regressing when we do so. One of my pet peeves, finally fixed. Loading spinners are now perfectly centred. Welcome back twitter, facebook. Follow us if you care. Self explanatory. Not sure how they got missed until now! Added as a prerequisite for the upcoming private messaging system. Change the setting from your settings page. 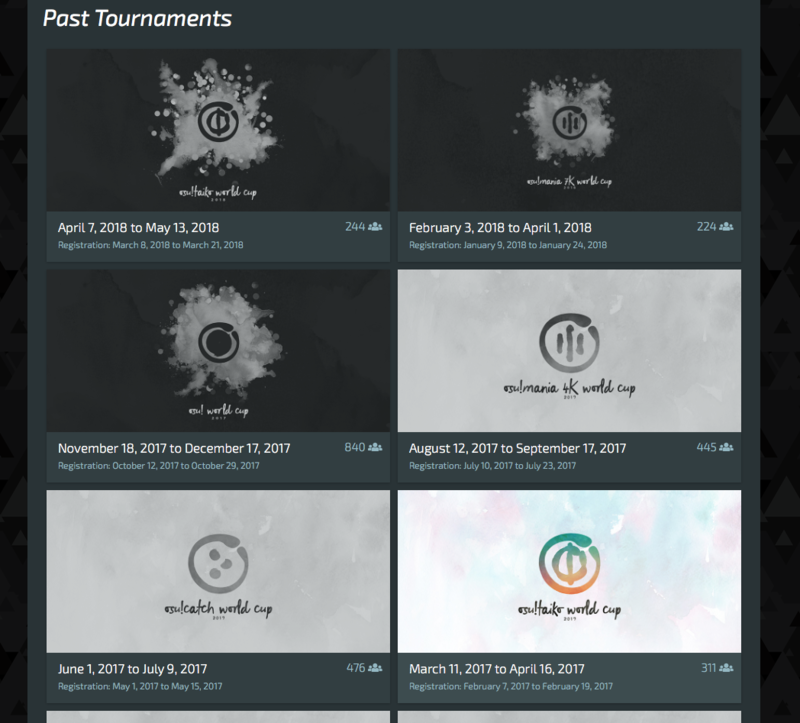 You can now view all previous official tournaments from the tournaments page. Easy way to get information about tournaments even after they have ended! This was missing since implementation of the modding discussion system. While not a breaking issue, it was indeed a bit weird seeing scores remain on the leaderboards until the point of ranking. We have moved our translations to the hosted Crowdin service, making it a lot easier for the community to jump in and localise the site (and everntually the game, too) to their local tongue. Go check it out and chuck in some help if you can, but either reviewing and voting for existing translations or filling in the gaps! Holy crap, did you actually make it this far? Thanks for reading. A lot of effort goes into these posts so I hope it was of some use.